LAST MEETING OF THE YEAR & Survey! Take a break from studying and join us this Thursday for our final meeting of the year, from 6:30-8:00 pm in the Sphinx Centennial Leadership Suite (different room from usual!). We will be having PIZZA and hosting Dr. Alison Bennett of the Department of Evolution, Ecology, and Organismal Biology. Additionally, complete the END OF THE YEAR SURVEY (https://docs.google.com/forms/d/e/1FAIpQLSdklhDy_bh8xjiCu1A5TQmXwQRm1Cocg7bUVy68Fn-OC0OLxA/viewform) to be entered into a drawing for a Starbucks gift card! Thank you for a great semester! Good luck and finish strong with your exams. We are officially in the home-stretch, everyone… Happy April! This is an incredibly exciting week for WIMS, as we will be holding a SPECIAL EVENT in place of our regular meeting this Thursday! Join us this Thursday, April 4th from 6:30-8:00 pm in the Rosa M. Ailabouni Room of the Ohio Union. 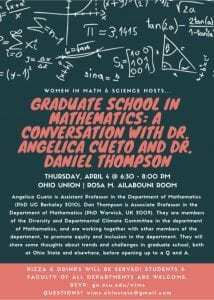 We will be hosting two individuals from the Department of Mathematics’ Diversity and Departmental Climate Committee, Dr. Angelica Cueto and Dr. Daniel Thompson. We will have PIZZA and REFRESHMENTS for a reception, which will take place during the first half hour of the event, followed by a presentation and discussion on diversity and related topics in the context of higher education. See the attached flyer for more details! Members and non-members, including students and faculty of any department, are invited to join the discussion for this exciting event! Feel free to share the our flyer with friends, peers, and/or colleagues! Please RSVP at: go.osu.edu/wims to best help us prepare for the event (read: so we know how much pizza to order). Don’t hesitate to reach out if you have any questions! Have a great week, & see you Thursday! Welcome back from break, WIMS! Our next meeting will be this Thursday, March 21st from 6:30-8:00 pm in the Rosa M. Ailabouni room at the Ohio Union. We will be having our usual mentoring session as well as hosting Dr. Jennifer Sinnott of the OSU Department of Statistics. We will also be holding our 2019-2020 board position elections! Check your emails or contact us at wims.ohiostate@gmail.com for details specific positions and how to apply. This is an amazing opportunity to impact the community and develop your leadership skills! Applications (+resume) are due to rodgers.304@osu.edu by tomorrow at midnight. Please come prepared with an elevator speech to our meeting on Thursday. Our next meeting will be this Thursday, February 28th from 6:30-8:00 pm in the Rosa M. Ailabouni Room on the 3rd floor of the Ohio Union. 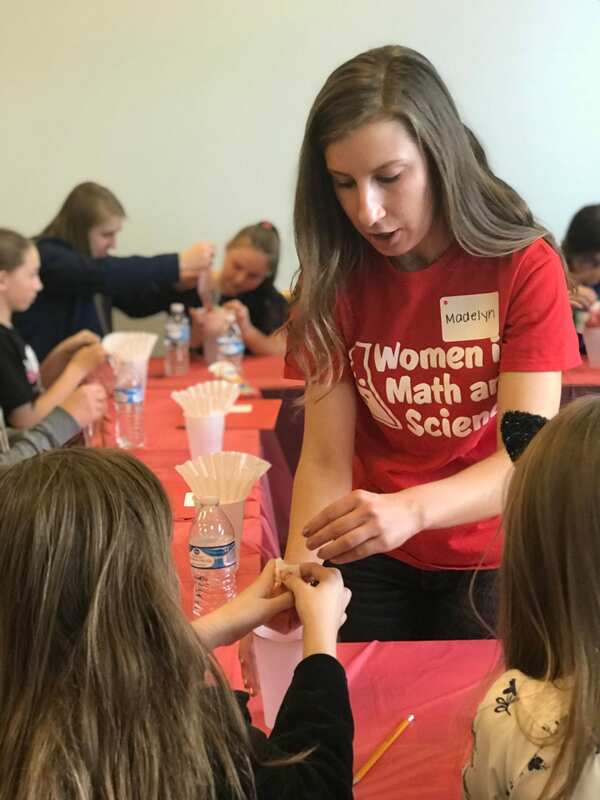 We will have out usual mentoring sessions followed by a presentation from Dr. Veronica Ciocanel, a postdoctoral fellow at the Mathematical Sciences Institute at Ohio State. This meeting is MANDATORY for everyone signed up to volunteer at our Girl Scouts Outreach Event! Our annual outreach event with the Girl Scouts of Ohio is right around the corner! On Saturday, March 2nd, we will be hosting over 50 girls for our “Detective for a Day” workshop, which allows them to use their math, science, and analytical skills to solve a mystery, culminating in their earning of the Detective Badge. We need your help to continue our event’s success! Please fill out this Google form to sign up to volunteer. Feel free to invite your friends if they are interested in this awesome event and/or are in need of service hours. Please plan to arrive around noon the day of to help set up. The event will run until around 4 pm, after which we will clean up and return the room to its original condition (this should not take more than a half hour or so). A brief training session will be MANDATORY and will take place during our next meeting: Thursday, February 28 @ 6:30-8:00 pm in the Rosa M. Ailabouni Room (Union). Contact Jennifer Tuokkola.4 with any questions or concerns! Our next meeting will be this Thursday, February 7th from 6:30 pm- 8:00 pm in the Rosa M. Ailabouni Room on the 3rd floor of the Ohio Union. We will have our usual mentoring session followed by a presentation from our speaker and faculty advisor, Dr. Adriana Dawes, about patterns in biological systems and how we can use math to understand them. Also, our BLAZE PIZZA FUNDRAISER is this WEDNESDAY! Please show the flyer (check out our facebook event: https://www.facebook.com/events/386390311921511/) printed or on your phone when you get Blaze from 6:00 pm- 9:00 pm this Wednesday, February 6th. Our second meeting of the semester will be this Thursday, January 24th from 6:30-8:00 pm in the Rosa M. Ailabouni Room on the 3rd floor of the Ohio Union. We will have out usual mentoring sessions followed by a presentation from Dr. Luanne Hall-Stoodley, a Research Associate Professor in the College of Medicine. ALSO, we will be holding a WIMS FUNDRAISER through Blaze Pizza on High Street. Just bring this flyer when you order pizza at Blaze on Wednesday, February 6th from 6:00-9:00 pm, and a portion of your meal’s proceeds will go back to WIMS. We could really use your support! Welcome back to school, WIMS! Our first meeting of the spring semester, Thursday, January 10th from 6:30-8:00 pm @ the Rosa M. Ailabouni Room on the 3rd floor of the Ohio Union, will be focusing on goal setting for the new semester/new year. We will also have our regular mentoring session. Attached is the WIMS newsletter for details on outreach, meetings, the SP19 textbook exchange, and if you would like to recommend a speaker! Wow, can you believe we are only a month from the end of the semester??! Let’s finish strong! REMINDER: We will be having our next meeting this THURSDAY, NOVEMBER 8th from 6:30-8:00 pm at the ROUND MEETING ROOM in the OHIO UNION! Free pizza (and a surprise delicious sweet treat) will be provided! Please pay your dues ($15) if you haven’t already so we can continue offering food at meetings. Our regular mentoring session will be occuring, where we will also be making pillows for the Nationwide Children’s Hospital (bring scissors if you have them). We will also be having Dr. Rosemary Bartoszek-Loza from the Department of Chemistry and Biochemistry speaking. Participants will be entered into a raffle for a gift card. The 2016 film “Hidden Figures” drew renewed attention to the challenges and successes of early women in STEMM fields. However, women still face reduced opportunities, inequality, sexism, and harassment while pursuing education and careers in STEMM. 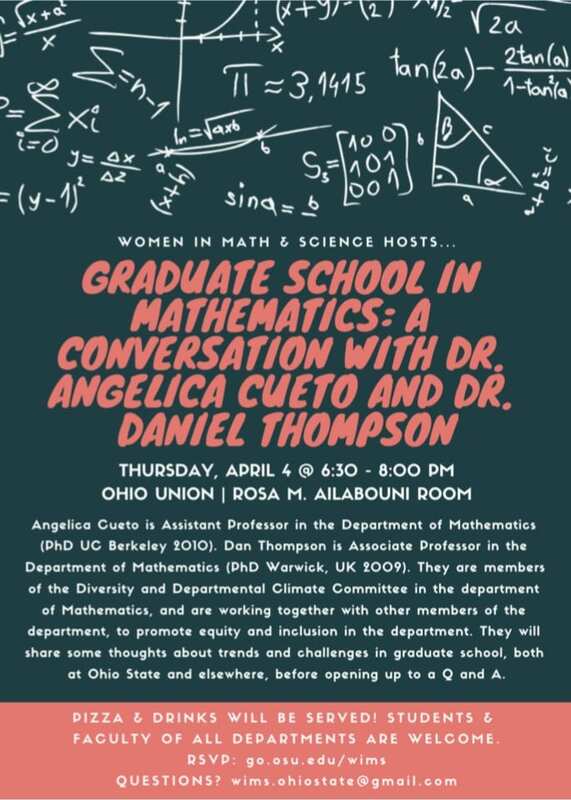 The Ohio State University Women in STEMM Alumni Society invites students and alumni to attend a panel discussion moderated by Dr. Nicole Nieto of the OSU ADVANCE office, along with current OSU STEMM faculty, on how to build on the awareness generated by the success of “Hidden Figures“. Afterwards, attendees will have the opportunity to network. Registration is required to attend: $5 for alumni and free for current undergraduate and graduate students. Event registration includes parking at Longaberger, pizza and soft drinks, panel discussion, and networking afterwards. Familiarity with the film or original book is not necessary to attend and benefit from this event. We welcome all who support women in STEMM.